Klejner, Kleiner, Kleyner? 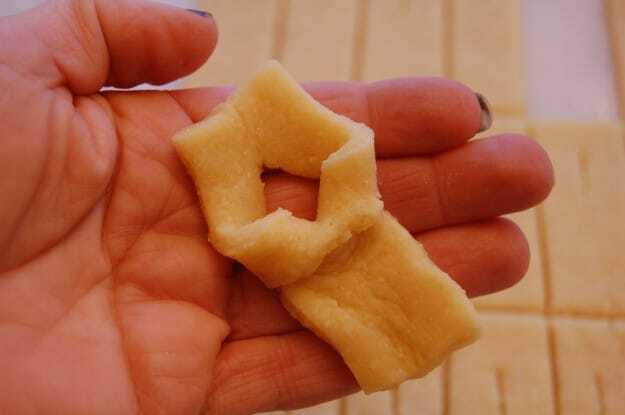 | A Danish Christmas Cookie. My name is Karen. I am of Danish descent on my father’s side. I’m also kindda great. In short … I am a great dane. How Danish am I you ask? Well I’m Danish enough to be able to say thank you and you’re welcome. Unless a comment or question can be answered with either of those two words I’m outta luck. And so is the person asking the question. I’m also Danish enough to be fair skinned, fair haired, and perpetually in need of sun. Somewhere in a shoebox there’s a picture of me tanning in a hole dug out in the snow in my parents backyard. That was back in the day when people wore sun tan oil as opposed to sun block. I wish I were tanning at this exact moment, but it’s Christmas and I refuse to go away at Christmas. Christmas is for arguing with family, complaining about not knowing what to buy people and withholding excessive amounts of liquor from my mom Betty. Oh! And cookies. Christmas is about cookies. 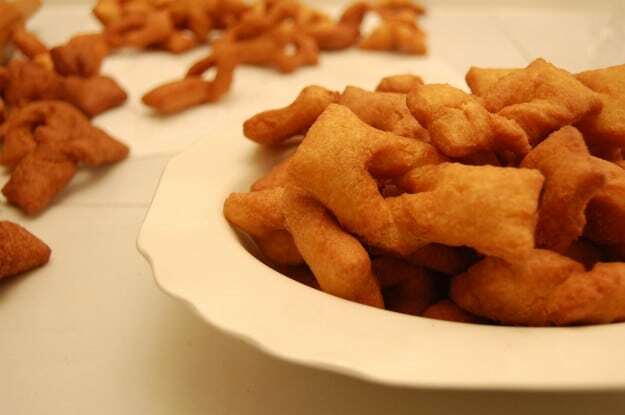 I inherited this recipe for Klejner, Kleiner, Kleyner from my father’s mother. Who, by the way, wasn’t Danish. Yet she is the one who taught me how to say thank you and you’re welcome in Danish. This is turning into a very convoluted post isn’t it? 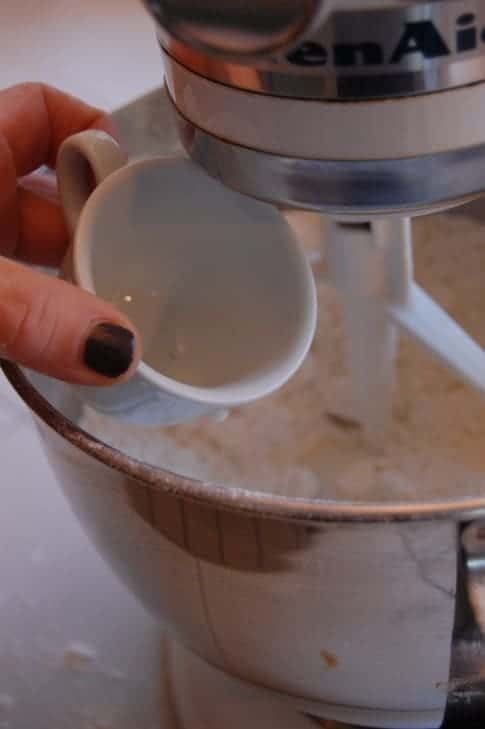 Add your dry ingredients to your handy, dandy mixer. Mix. 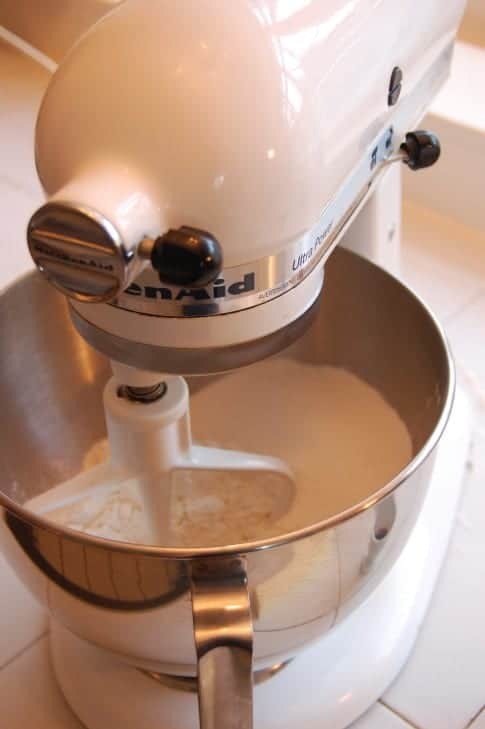 If you don’t have a handy, dandy mixer … mix. By hand. Add your vanilla. Or your neighbour’s vanilla. Whatever you have on hand. 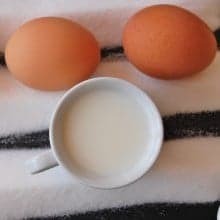 Add your milk. Or your cow’s milk. You can even add CREAM if you want! Mix. Are you sensing a theme here? 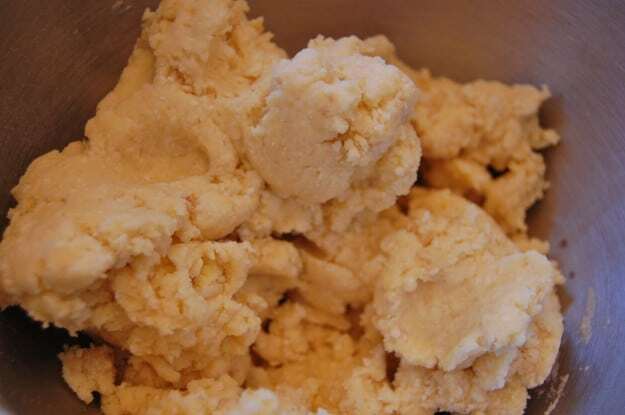 Once you have everything mixed together pick some of the dough up and feel how sticky it is. 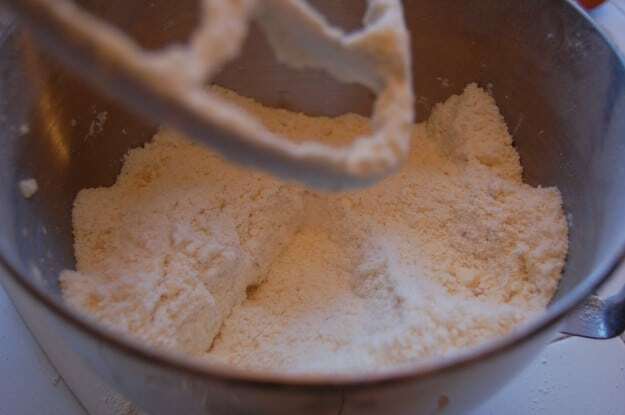 If it feels sticky add a tiny bit more flour and mix again. 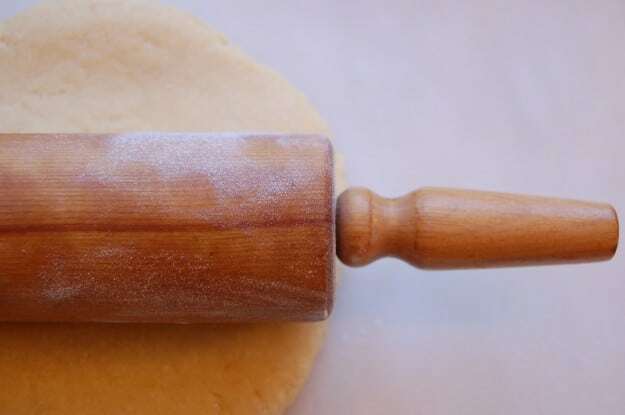 You want the dough dry enough so it isn’t sticky, but not so floury that it’ll crack when you roll it out. It will look like this. Except your pastry board might be different. You might not even have a pastry board! 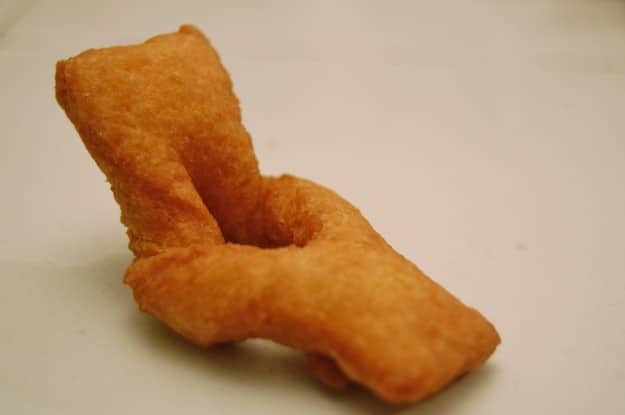 Just be prepared for a few differences when you look down at your blob of dough. 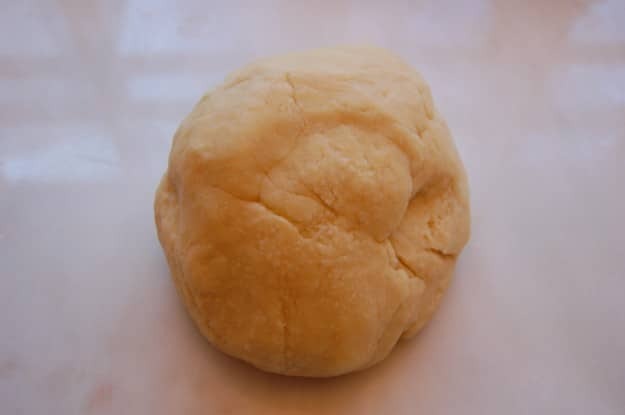 Divide your dough in half and roll it out into something as close to a rectangle as you can get. It needs to be between 1/8 and 1/4 inches thick. Closer to 1/8th. 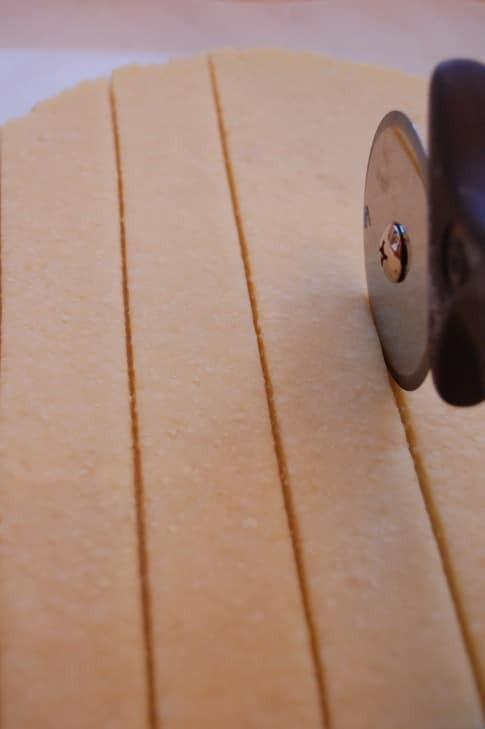 Using a knife or pizza cutter, cut the dough into 1″ wide strips. 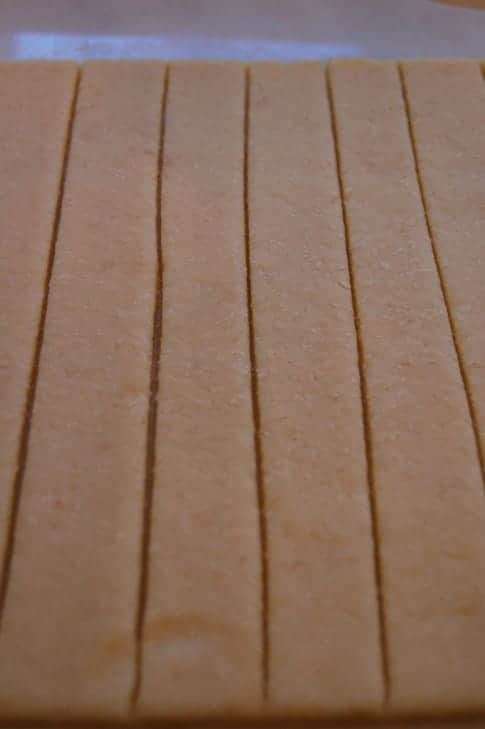 Then cut the dough the other way so you have 3″ strips. 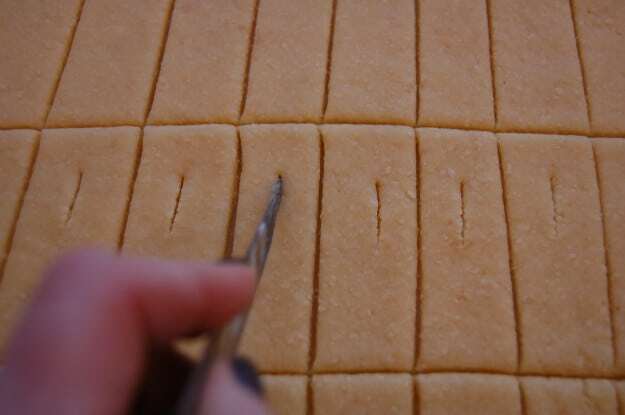 Using a knife, cut a small slit close to the middle of the strips. Now you have the base of the cookie. Fold the longer end of the strip into itself a little bit. Bend the end towards the hole in the cookie. Insert the end into the hole. Repeat with all the dough until you have a big pile of uncooked knotty looking things. Now whip out that deep fryer and heat it to its highest setting. 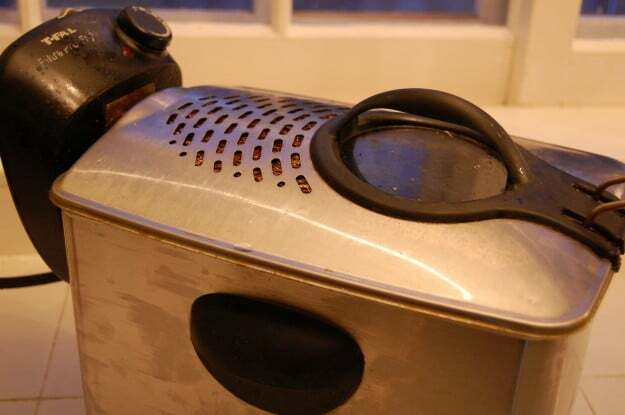 If you don’t have a deep fryer you can fry them in a pot. Yup. They’re fried cookies. The best kind of cookie as far as I’m concerned. 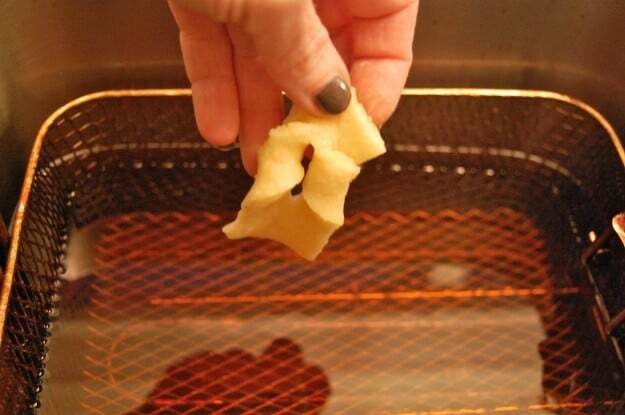 Carefully drop your cookies into the fryer. You can do about 10 or 12 at a time. Once the cookies have browned on one side, flip them over with a fork or whatever you have on hand, so the other side gets browned. They only take a couple of minutes to cook so keep an eye on them. The cookies will be golden brown. Like you’d expect a fried cookie to be. If you’re a bit of a pansy you can drain them on a paper towel. I happen to be a pansy. As they cool the cookie will get crunchy. At this point you can either admire them or eat them. Or give them away. 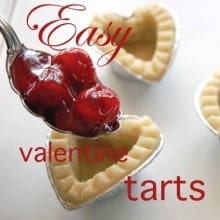 Or eat them. And that my friends is how you make a Danish Christmas Cookie. They’re one of my favourites, because they aren’t overly sweet. In fact they aren’t very sweet at all. 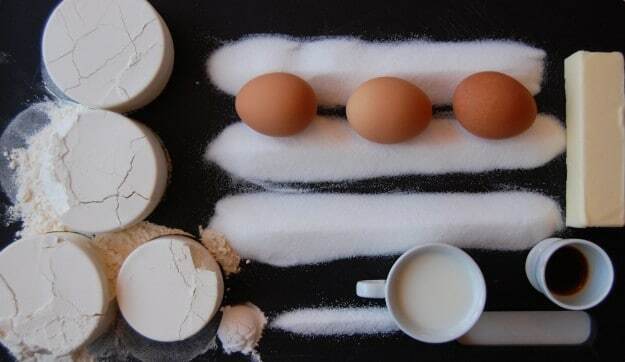 If you want them sweeter add a little bit more sugar. Another classic way to make this cookie is to omit the vanilla and instead add a bit (1/4 tsp) of cinnamon or crushed cardamom seeds. They aren’t quite as fantastic as a good, reclining soak in the sun, but at this time of year … they’ll have to do. 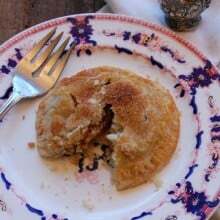 Apple Hand Pies! An Ashley English Recipe. 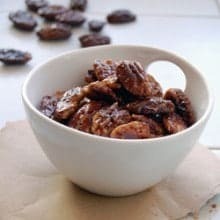 How to Make Candied Nuts! If Seinfeld and Friends can do it, why can’t I? 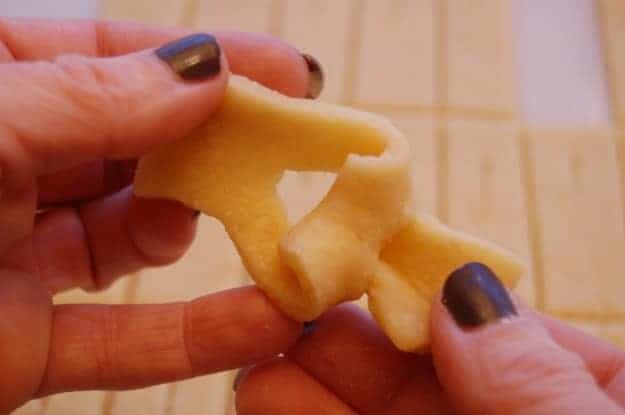 My Swiss-born grandmother made the same little treats every Christmas. She called them Schlieferlies.The tradition has carried on for 4 generations in our family. 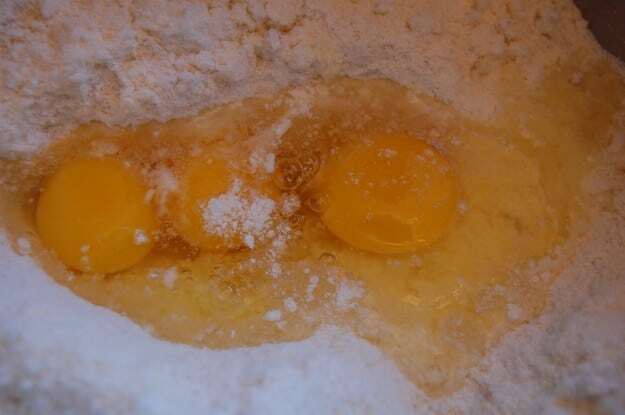 The recipe is very similar, but much heavier on eggs – s single batch uses 9 eggs. 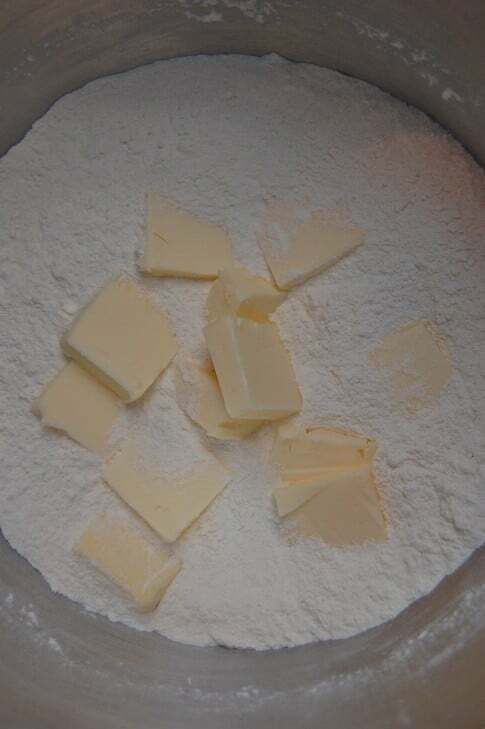 We cut them and fry them the same way,and dust them with sifted powdered sugar when they have cooled. 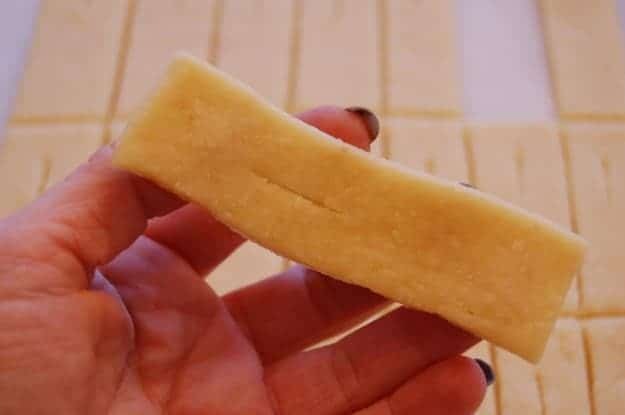 both my parents and all my ancestors are Danish, and this recipe of yours is nothing like the original, sorry but just had to let you know that. 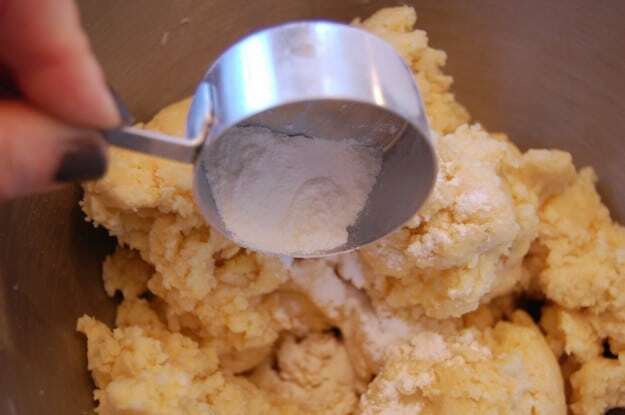 there is no baking soda in this recipe, its calls for baking amonia, and whipping creme. my mom used to make these every year for Christmas, and now that she has passed away, my older sister now makes them every year for Christmas. your recipe has been altered. although i’m sure they are quite good, it’s not an original recipe. LOL. Well, June, Kleyner is kind of like Shortbread, there are a million different recipes. So it’s not a matter of being the original recipe or not, more a matter of which original recipe. ~ karen! Thanks for your comments, we have always used the baking amonia, but very hard to find anymore. 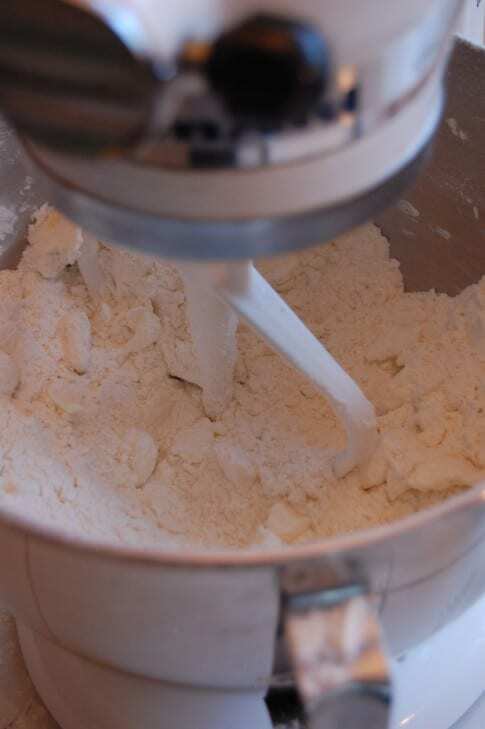 I believe the whipping cream was also in our original recipe. I will be in trouble if I don’t fix these tomorrow. I consider myself the melting pot of America (six nationalities), married to a Swede – Norwegian for almost fifty=five years. I make Fattigman, the name used by the Swede Norsks for this recipe. But this year I am going to use this one as my grandson’s girlfriend was telling me hoe much she missed having them at Christmas since her grandmother is gone. Had a terrible time finding the recipe as she didn’t recall the name, but perseverance and the internet came through. Thanks so much for your web site. Good luck with them Verna! I have *never* seen the same kleyner recipe twice. They’re all different! But this is the one I grew up with from my grandmother. The only problem is, I have no idea if she was a good cook, lol. Hope your grandson’s girlfriend likes them. ~ karen! I am first generation American as both my parents moved to the states when they were children. 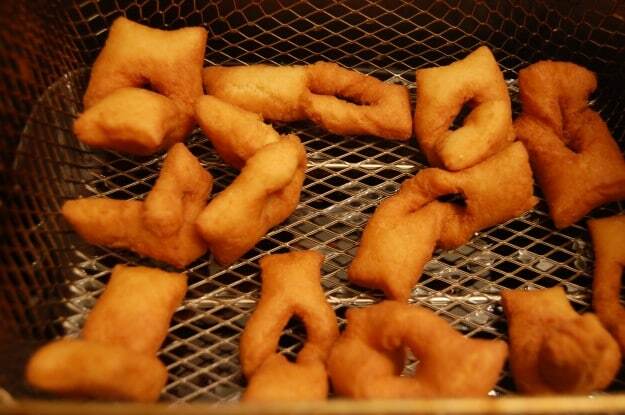 We make Klejner every year though we put grated orange peel in…so good! We also deep fry them in Crisco shortening. Have you ever made Aebleskiver? 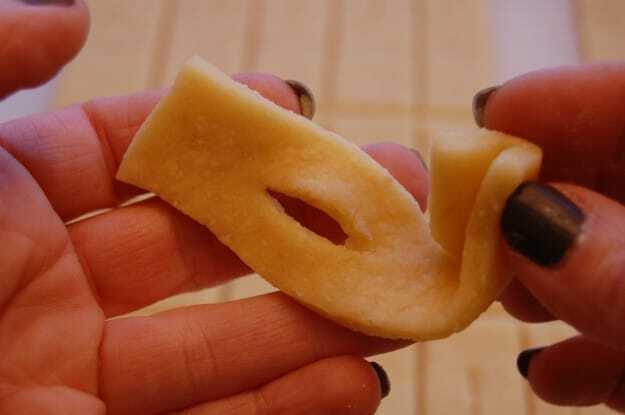 Is there any significance to the shape of the Kleiner? Hi Karen, My name is Karen also and both my father and mother were born in Denmark. I have made Klejner for decades now. Thought you might like to try a different shape as well. 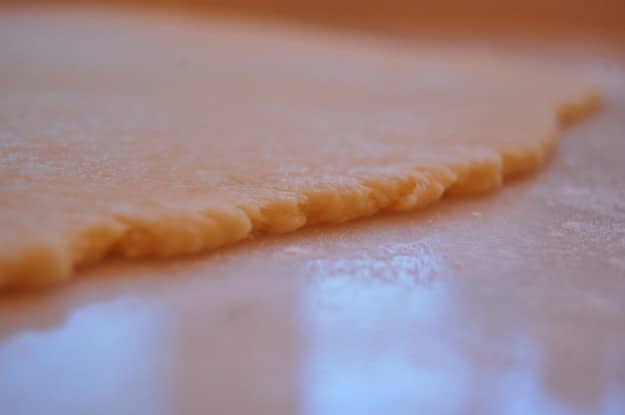 Cut the dough as a rectangle on an angle ( as in a diamond shape) and make the slit in the middle pointing to two points , you still take one point and slip it through the middle and it works the same, just looks neater. The oldest Danish cook book that I have, and I mean old, recommends Crisco. I use cardamom and Almond flavoring. 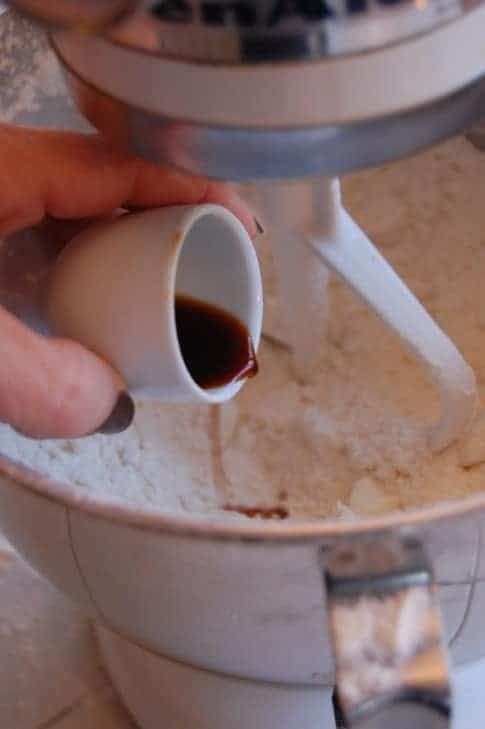 For the Aebleskiever we put out small dishes of powdered sugar, apple sauce and red raspberry preserves for the guests to choose from and even some like maple syrup to choose from. Hi Karen! I’ll be making Klejner this week and will indeed be adding cardamom. 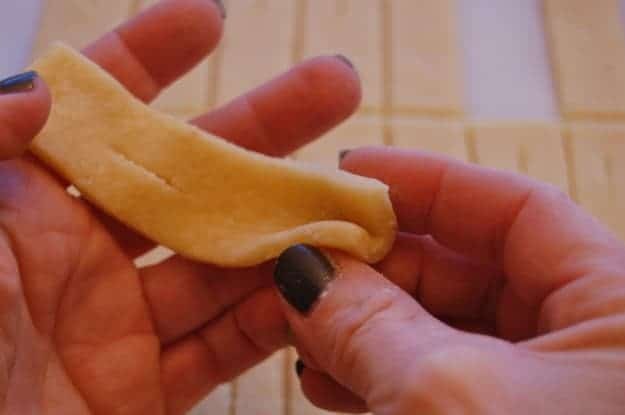 I’ve seen that shape but have never used it because my grandmother taught me to do it this way but maybe I’ll give a few of them a shot to see how they turn out. 🙂 ~ karen! Hi Karen! I am estonian and it’s really amazing, how some recipe (or it’s modifications) is widely spread. 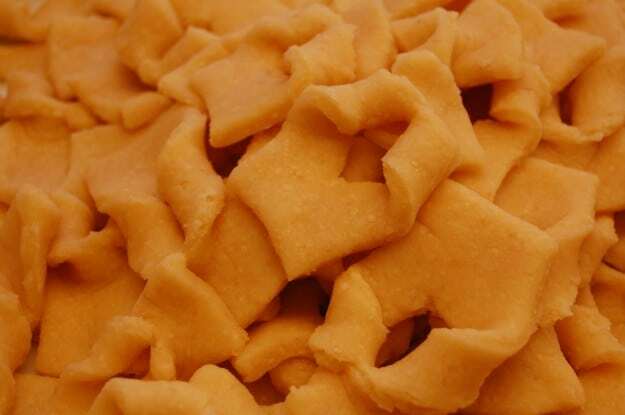 these cookies have been made in Estonia also and they are called ears of pig 🙂 (seakõrvad). This is wonderful. 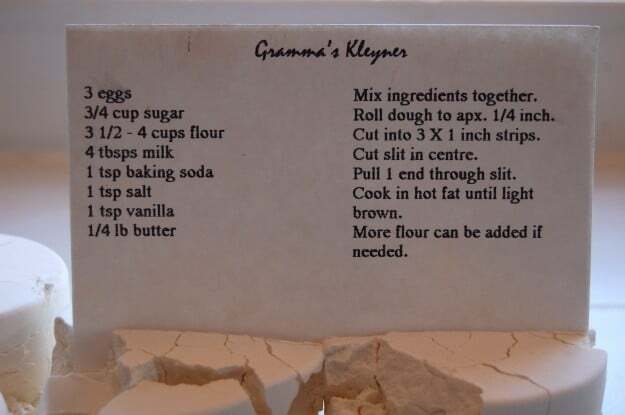 Very similar to a recipe my grandmother passed down, which it seems she spelled completely wrong, but here’s the recipe: http://www.nemelkafamily.com/kliner.html. A key ingredient her recipe includes is Almond extract, at about 3/4 the amount of the vanilla. Adds a very memorable aroma at Christmas time. I just made my klejner last night Anthony. And I ended up omitting the vanilla and using cardamom. I think it could handle both next time. I also did what another reader suggested and dipped about half of them in sugar after frying them. Wow. WOW! They’re delicious. I’ll go have a look at your recipe now. 🙂 ~ karen! As you might now, klein, comes from German meaning small- However we Danes (100% born and raised myself) have a similar word, klejn, pronounced “kleyn”, also meaning small or fragile. So, the proper spelling would be klejne. (J is pronounced as your y, hence Jensen is Yensen and so on). So, one cookie is klejne, two or more cookies would be klejner. “Klejners” would be plural with added English plural.. I remember these from my childhood. 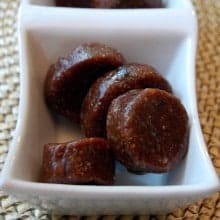 My Danish grandmother used to make these every Christmas but with cardamom. 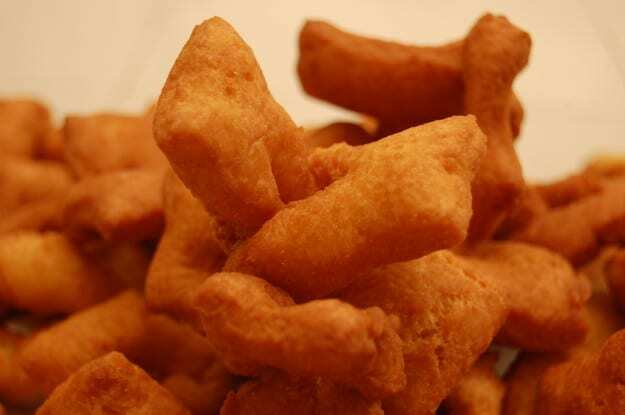 My aunt actually was the one who taught me how to bake and fry these. I’ve been adding cardamom for the past few years now Karen! It’s great. Apparently my grandmother was making them wrong her whole life, lol. I’ve rectified that now. 😉 ~ karen! My blog is in the very same niche as yours and my users would truly benefit from some of the information you provide here. 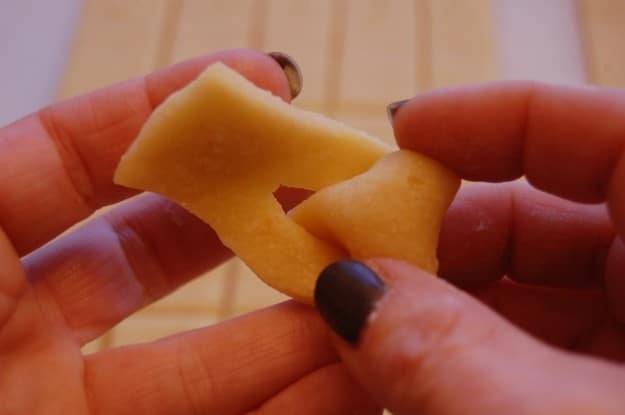 My mom (from Copenhagen) made the cuts so that the cookies are a parallelogram before turning inside out. They lay flatter. 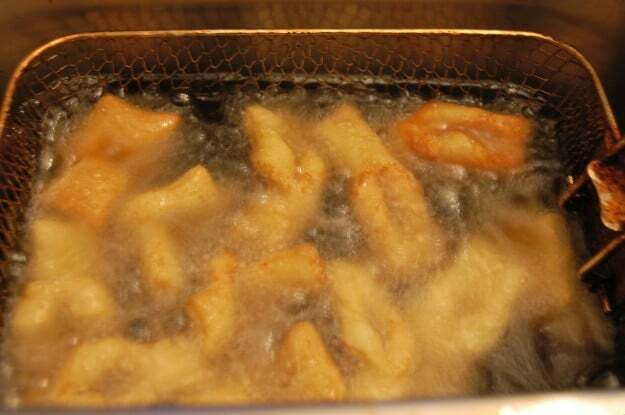 She used a deep fry pan to make them. 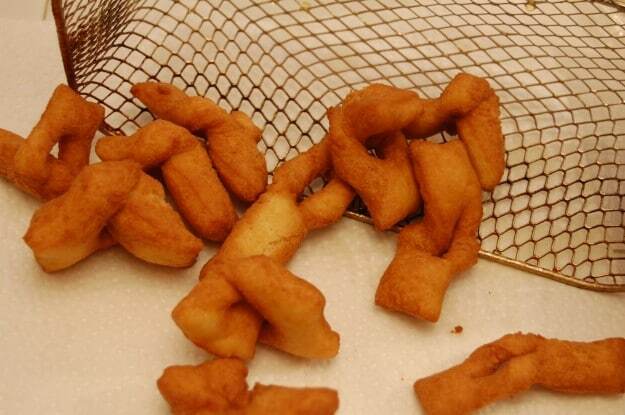 I have never made them because I am a little scared of deep frying in my home, but I may be adventurous this year. ! As a child I really loved helping mom making these. my name is also Karen and I am half Danish on my father’s side as well! Middle name is Michelle. What’s yours? 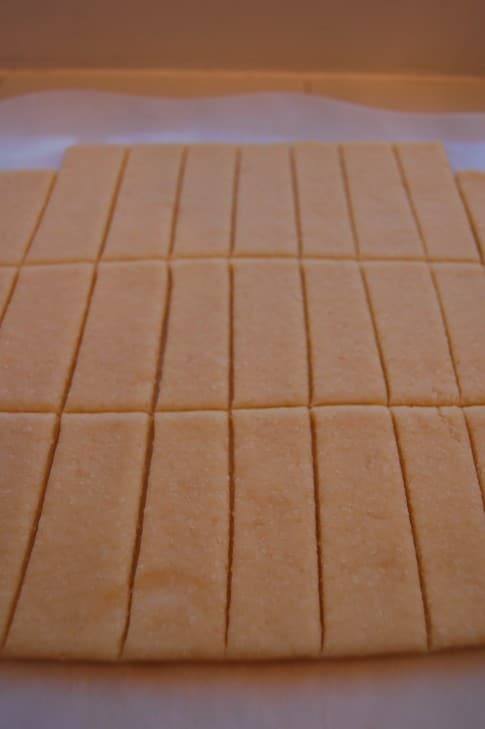 Anyhoo, you make yours just like my Aunt and I do, except we use Ammonium carbonate, aka Baking Ammonia and then we sprinkle them after frying with powdered sugar! They are GREAT! Thanks for sharing and letting me share! Saya penasaran untuk mencari tahu apa blog Platform Anda memanfaatkan ? aman. Apakah Andaa memiliki rekomendasi?